Emails are a dialog medium. Forwarding emails produces reply mails, forwarding many emails produces many replies. XQ:Maileon processes these incoming emails fully automated, efficiently and in an intelligent way in several steps. Each incoming email will first be allocated one of the following categories – manual reply, spam, bounce, challenge response, auto-responder (receipt notice), subscribe request, unsubscribe request, profile change, absence notice, provider request (list owner) and help request (list help). This categorization is done by the help of self-learning algorithms of our artificial intelligence (AI), which has been trained with thousands of test mails. This innovative approach results in significantly better categorizations (i.e. less mistakes) than conventional systems with static rules. Bounces will processed in the bounce management and spam will be deleted, all other categories will be consigned to the next step of reply mail processing. In the next step all emails will be allocated a particular mailing and a particular recipient by the means of various analyses (header, content, sender). This cannot be done in 100% of the cases because the dispatching mail servers often omit vital information. Sometimes replies come from persons who hadn’t been on the original distribution list. This can happen when recipients set up email forwarding. All incoming emails accumulate in an inbox. This is a special mailbox, accessible through specific filters (time spans, dispatches, reply mail category, free text). 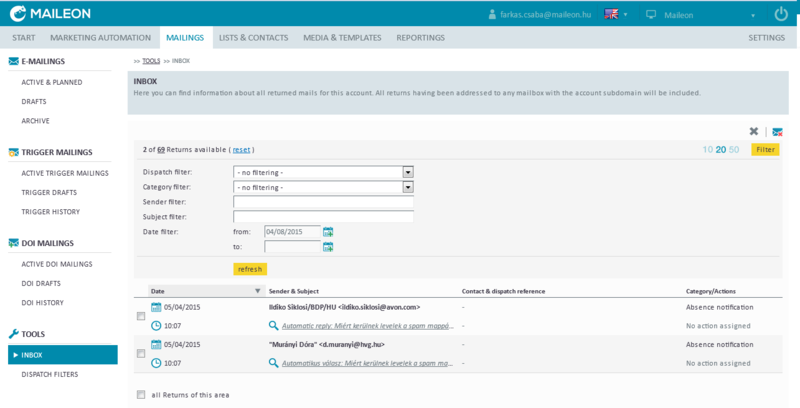 With the help of these filters you can display all favoured reply mails including those that cannot be allocated a particular mailing or contact. In case of incorrect classification, the user can re-categorize the email at any time. These manual re-classifications serve as automatic input for the self-learning AI algorithm. Reply mails with similar attributes will thus be allocated the correct category more likely. In many cases reply mails require action (e.g. unsubscription) on the part of the sender or might be beneficial (e.g. forwarding a manual reply). Different types of actions are possible, depending on the type of reply mail. XQ:Maileon executes inevitable actions such as unsubscriptions automatically, all futher actions can be configured independently in the reply mail processing settings. You can view the processing status for each incoming mail.